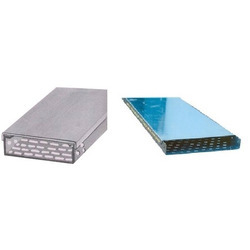 Manufacturer & Supplier of Cable Tray Cover. Our product range also comprises of Cable Trays, Perforated Cable Tray and Stainless Steel Cable Trays. Our company is counted among the most prominent manufacturers and suppliers of optimum quality Cable Tray Cover. Offered tray covers are manufactured in accordance with industry set parameters under strict supervision. Our professionals use good quality aluminum and steel in the manufacturing process. Known for their durability, user friendly design and cost-effectiveness, these tray covers are widely demanded by our clients. Looking for Cable Tray Cover ?